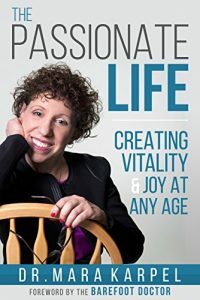 In The Passionate Life: Creating Vitality and Joy at Any Age, with the Foreword by The Barefoot Doctor, Dr. Mara interweaves her twenty-six plus years of expertise as a psychologist, her own personal experience, and the wisdom of today’s thought leaders on physical, emotional, and spiritual health into these pages. Readers will gain valuable tips for creating a meaningful, vital, and joyful life––no matter what challenges they may face. The Passionate Life is a guidebook for the exciting trek we call “life.” Whether you are early in your journey, moving into a new chapter of life, looking to climb out of a rut, or finding your way again after being lost for years––this book is for you! Dr. Mara shares a wealth of knowledge to help us all feel vital and alive––physically, mentally, intellectually, and spiritually––well into our golden years.